1969 Massachusetts REGISTRATION Sticker - $20.00 : Bob Hoyts Classic Inspection Stickers, Add a Final Touch to your Restoration! This is a 1969 Massachusetts REGISTRATION Sticker is NOT an inspection sticker, BUT YOU NEED IT if you want your classic to be correct. Massachusetts did not issue license plates in 1968 or 1969. 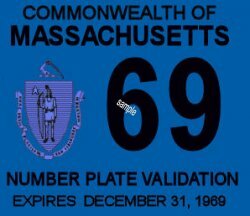 This sticker was issued by Massachusetts to validate the 1967 License plates with a 1969 registration. This sticker will also go on the windshield in the top center next to the rear view mirror.This was the last year Massachusetts issued windshield registration stickers. Starting in 1973 Mass issued plates with no dates and each year issued a small sticker with the year on it to attach to the license plate. These are "peel and stick" stickers BETTER than the originals.